Just don't see that program turning around. Seems like there is always controversy. Different opinions on how to run the program. Of course, Lurker gets a D in spelling! 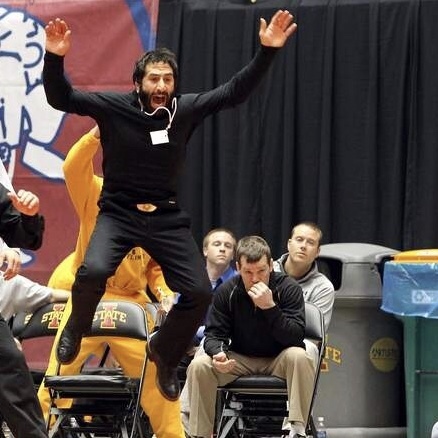 Oh, Iowa (sort of State): Metcalf strikes me as the shrunken embodiment of a dogmatistâ€”a self-certain, one-dimensional, if once halfway talented, grappler turned quasi-coach. Was he born, domesticated, and raised as Brand's yapping Chihuahua (a role for which Sir Thomas Gilman now jealously competes)? His intonation and approach appear to have been bred in a heated den of bravado . . . and, as insiders suspect, cloistered iniquity. If Metcalf had a motto or bumper sticker tattoo-ed on his backside it would be something like "No Subtlety". Thankfully, this sort of approach does not possess much of a future in the NCAA or international arena. Perhaps he was the last best incarnation of Gable's midwestern "working class" style. The most important characteristic of an assistant coach is loyalty to the head coach. I have to admit.. after Brands let him go, I thought Brands made a big mistake and it might have been possibly stemmed in his own ego/insecurities. Now that Dresser fired Zadick as well, it seems that Zadick is the problem and he probably has major issues not being the head guy in charge. Anyone with actual knowledge of what the beef was between the two? "Differences of opinion" is the blanket PC statement to make in such cases but there has to be something specific. Was it ongoing or one big incident? Zaddick could be done coaching. After being fired twice by respected coaches, not sure someone would want to hire him. What did Tupac say? Anybody with a beard like that is guilty?! I had nothing but respect for Dresser after the job he did at Virginia Tech, but everything about his move to Iowa State has been filled with drama. I kind of get the impression Zaddick doesn't really care a lot. He was living in the woods when he was asked to go to VA Tech and seemed pretty happy living out there doing his thing. He was helping out at a high school too, so maybe he would do better where he isn't under pressure to win and just has fun with it. I don't get all the comments about drama at ISU. No matter what the sport, any time a new coaching staff takes over, there is roster turnover. This doesn't mean the environment is "toxic". Seems like it was a combination of different philosophy of how practices were run, combined with a physical altercation with another staff member. Was Zaddick coaching with Dresser at Virginia Tech before Dresser took the ISU job? If so for how long? Is it just me or could you substitute Dan Dennis in here and not really miss a beat.